Since the events of 9/11, over a million U.S. service members have been deployed to Iraq and Afghanistan in the war against terrorism. Currently the U.S. has nearly 140,000 troops still deployed. The DOD estimates that 360,000 returning service members suffer from Traumatic Brain Injuries (TBI) and over 31,000 have sustained other serious injuries. In addition to these injuries many will suffer with anger management, depression, and substance abuse issues. Currently the City of Los Angeles has the largest homeless veteran population in the United States. Over the course of the year, in the United Stated States, an estimated 144,842 veterans spent at least 1 night homeless, living in emergency shelters or transitional housing units (HUD, 2010). Cops 4 Causes is committed to ensuring services for our fighting men and women will be available when they return. Cops 4 Causes supports “Joining Forces” comprehensive approach to providing support vital to helping our veteran’s transition from military life. Funds raised by our efforts will support veteran employment, education and wellness programs national. The objective of “Heroes Helping Heroes” is to inspire and mobilize the first responder community to do our part to help our brothers and sisters who serve our Nation’s military. The Cops 4 Causes program under our R.J. Cottle Returning Heroes Veteran Fund, is a unique opportunity to forge a partnership between “Joining Forces”, the first responder community, sponsors and community supporters to give back and to help our veterans. Law enforcement and first responders by virtue of their status as public servants have the ability to speak out and to connect with ordinary Americans from all walks of life. 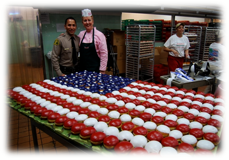 “Working together” we will unite and help support our veterans – Heroes Helping Heroes. 1% of Americans may be fighting our wars, but we need 100% of Americans to be supporting our troops and their families. Cops 4 Causes has heard the call to action and has enlisted the help of our public safety community to do our part to support our 1st Responder community. In addition to establishing our “R.J. Cottle Return Heroes Veteran Fund,” in honor of LAPD SWAT Officer and USMC Sergeant Major Robert James Cottle, Cops 4 Causes has endeavored to inspire all 800,000 sworn members of law enforcement throughout America to lend a hand. We invite you to join us in support of Joining Forces and to take part in Cops 4 Causes, “Heroes Helping Heroes”. 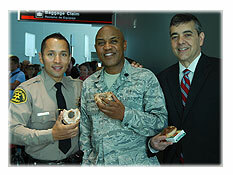 On Presidents Day 2012, U.S Congressman David Rivera, Los Angeles County Sheriff’s Deputy Christopher T. Landavazo, U.S. Southern Command Chaplain Lt. Col. Marvin Williams, Ronald Infantino (Eastern Flight 401 Survivor) and German Consul General Eva Countess Kendeffy, enjoy Krispy Kreme doughnuts during a ceremony held at Miami International Airport to commemorate the shipment of 6,000 Krispy Kreme doughnuts being donated to U.S. troops stationed throughout Europe. 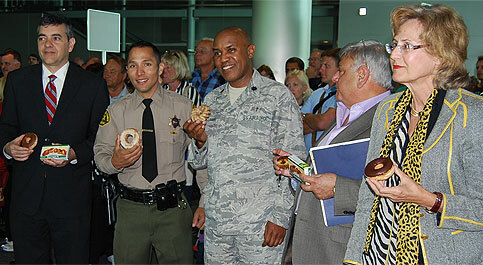 In 2013, Cops 4 Causes partnered with USO Germany and returned to Germany with a delegation of Police, Firefigters and supporters and delivered 700 care packages to our troops stationed at Ramstein, Germany.